I smell fads from a distance – doesn’t help that I poke my nose into all things I can poke it into. Some fads are good though in that they generate sufficient buzz to get executives allocating budgets to stuff that their staff has been asking for or talking about for some time and which didn’t make sense to those executives from a quarterly growth target point of view, until the buzz – often generated by a new fad getting popular or term throwing, sharply dressed consultant from a top consulting firm doing a brown bag session or other executive instructing session(s) with the right executives in the room. Other fads, just serve the ego of their protagonists. Design thinking (given the buzz it is currently enjoying) is another fad. A useful fad! So, what exactly is design thinking? In simple terms, it is putting the customer front and centre in the development of new products and/or services or modifying existing ones. Duh… that’s what all product development teams should do, build stuff that customers need (or want) and can pay for and not what those product teams want. Half the time, we don’t know what these things are. And some other times, we can read the tea leaves of customer feedback, insight from usage data and/or by asking customers directly. Hey, before you come here with your arguments backed by the popular Steve Jobs one-liner that: “…the customer doesn’t know what they want until they see it”, let me introduce you to the most successful historic outcome of design thinking: the mouse which first accompanied an Apple Computer. That one liner I am certain when put in context – social, economic, political, cultural, political and/or technological – doesn’t exactly mean go on and build whatever tickles your fancy, your customers are too dumb to know they needed it anyway. 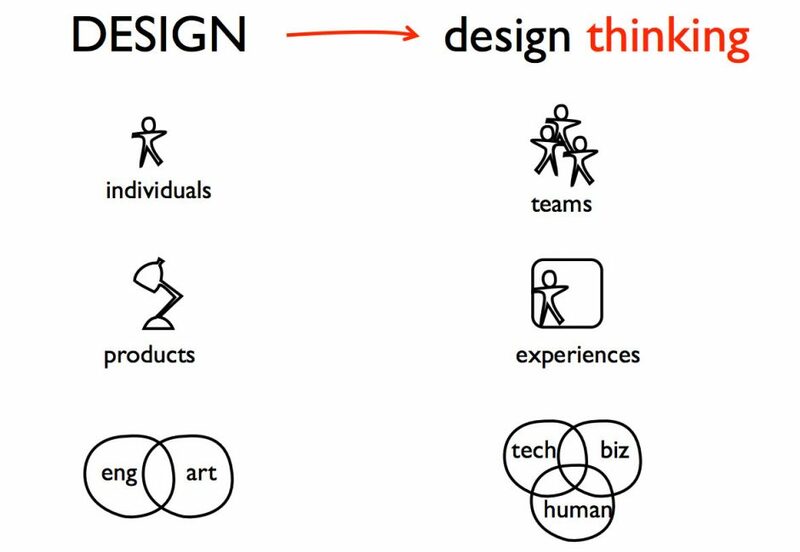 It is important to know that design thinking is more of a mindset or thought process for approaching work (creating value for customers and shareholders) than a framework or toolkit that can be spoken about and simply expected to run itself. It can and should serve as an overarching guideline for the selection of product (or project), a delivery methodology (or mix of) and continuous monitoring of the product (or project deliverable) in the wild. These pillars could encompass a variety of tools and vehicles in accomplishing their key outputs, are iterative and requires open minds – one that assumes a lot, open to discovery, doesn’t despise learning and adjusts position when presented with data-driven – evidence-based knowledge. Empathy – frame a question about your customers (and potential customers) that your firm should answer to generate value for the customer and for your firm. Tools my include but are not limited to: observing customers or target customers in the wold and seeing what their struggles are with your products/services or those of your competition; asking customers directly what their pain points are and what their ideal solution will look and behave like; distilling insight from data (usage data if you currently collect such, or competition data analysis). Define – collate your findings and paint a picture of the problem(s) that needs to be solved. You may begin to write requirements’ specifications here as well start to document the features of a solution (from your questions to customers on the subject of what a robust solution looks like) – user stories is a flexible yet useful tool to consider here and possibly a Kanban board structured to organise user stories according to how well defined they are, where in the delivery effort the user story is in etc. may also come in handy. But defining a problem isn’t once off and will be impacted throughout the repetitive process that constitutes all phases of design thinking. Ideate and prototype – My preference is to not separate between Ideate and Prototype. Both phases are fluid and easily merge into each other, given prototypes can be created as ideas are generated. Test – that the prototyped ideas are a hit (or will be a hot with customers) is super important. This phase like all the others need to be approached with an open mind. New, previously unconsidered angles are likely to be discovered and testing provides another opportunity to empathize with the customer, especially with the advantage of a solid solution idea or an actual prototype. How will taking a design thinking approach help teams, their employers and their customers create value? Note this is part of a series of writings that are geared towards my planned 2019 book: The BA Book. I am deliberately grouping them together here as first drafts as that is what most of them are. Doing this helps me stay accountable as well as gain early feedback from stakeholders. Your comments and feedback on this early thoughts will be appreciated and applied towards further shaping the research that will go into the writing the book.